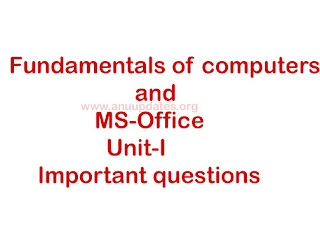 Hare are the Nagarjuna University Fundamentals of computers and MS-Office Unit-I Important questions. Totally the first unit will be covered in two chapters and here you can find important questions including these two chapters of first unit. Write short note on the characteristics of a computer. Computer works on the garbage-in, garbage-out concept.Comment. Explain the evaluation of computers. Also, state how computers in one generation are better than their predecessors. Broadly classify computers based on their speed, the amount of data that they can hold, price. Discuss the variants of microcomputers that are widely used today. Explain the areas in which computers are being applied to carry out routine and highly specialized tasks. How does the keyboard works? Explain the working of different types of mouses. How OCR technology better than an ordinary image scanner? How does MICR technology help to detect fraud in cheque scanner? Web cameras can be used to check security in a bank. comment. How are projects used to display information to the user? How are headsets are better than speakers and headphones? Differentiate between impact and non-impact printers. Can characters of different fonts be printed with a band printer? Why is a line printer preferred over a dot matrix printer? If you have an image to be printed, which out of the two will you use and why? Under which situations will you prefer to use an inkjet printer over a laser printer? How is plotter is different from a printer? Explain the variants of plotter? What are input devices? Discuss the different types of input devices in details. Give a detailed note on different note on different output devices. How is a touchpad better than a trackball ? Which pointing device would you prefer to use, mouse or trackball? Justify your answer. Give the application of touchscreen. What are optical input devices? Where are they used and for what purpose? Differentiate between a soft copy and a hard copy output. Which factors will you considered while purchasing a monitor for your personal computer ? After considering the factors, which monitor will you buy? What is a data projectors? How is it different from a computer screen?